The surprises kept coming on the beautiful Pacific Coast Highway, which began in Washington and continued along the edge of the Pacific Ocean through Oregon and California, stopping at San Diego. Meandering roads kept driving speeds at 15-20 mph, or perhaps it was partly due to the spectacular views. When driving and watching the scenery at the same time, slower speeds were definitely required especially with many steep cliffs at the ocean’s edge. 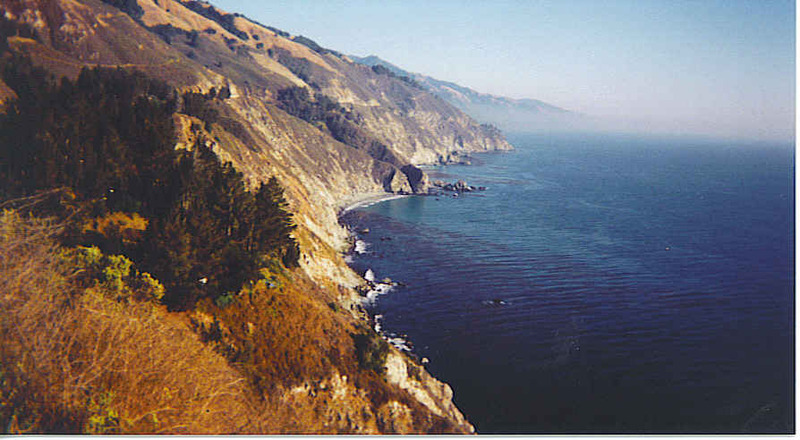 With beaches galore and piers aplenty, Pacific Coast Highway, also known as America’s Most Beautiful Drive, renewed your spirit and your senses, as you encountered many unusual scenes along the way. 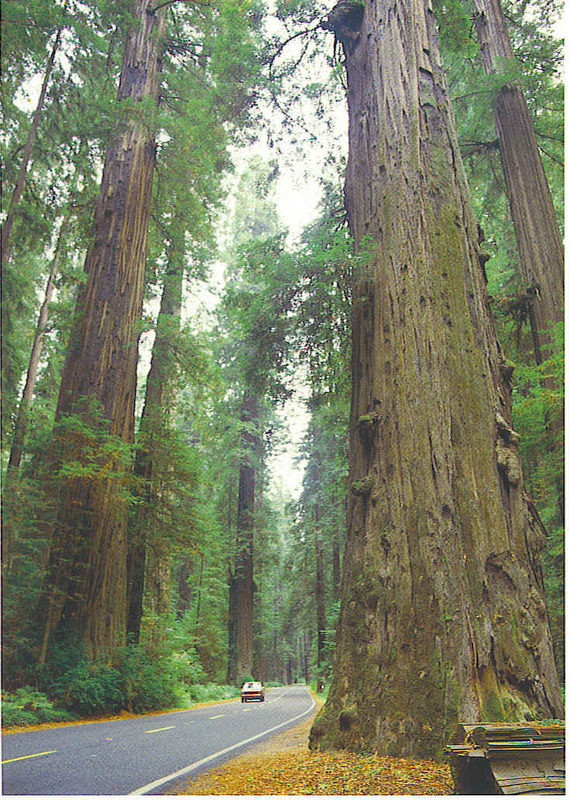 This curving highway passed right through the awesome giant redwoods on a stretch called Avenue of the Giants.This was the place where trees were large enough for a car to drive through or even have a gift shop inside. Words can not describe the wonder of these giants as you attempted to look skyward to see their highest branches. These towering trees, rock formations and ocean waves made you realize the power of Mother Nature and the role she plays in our beautiful world. Even on a foggy morning, the picturesque combination of mountainous cliffs on one side, and the waves crashing against the rocks on the other, made your heart beat just a little faster. 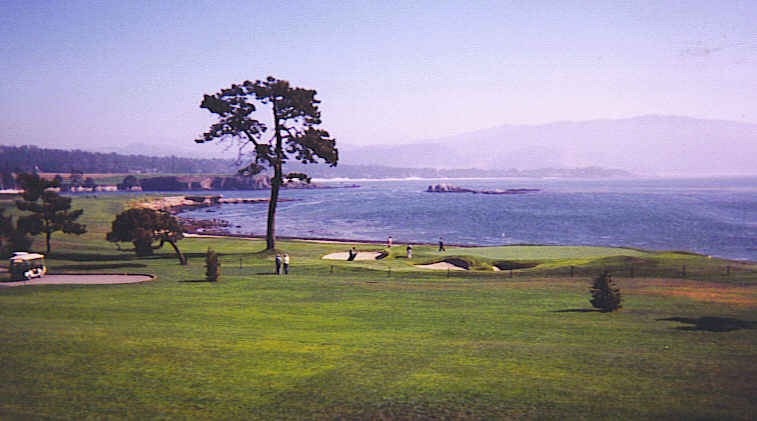 After spotting a sign that said Pebble Beach Golf Links, thought the golfers in my family would be happy to know I stopped for a visit, as this is home to some of the world’s most prestigious golf tournaments. Evidently it was a day without a tournament scheduled, as admission was granted to drive up to the luxurious lodge and even to walk on the course. My camera definitely wanted to snap a picture of the famous 18th green to prove my story wasn’t fiction. Near Big Sur the mountains seemed to plunge into the Pacific. Unusual black rock formations rose out of the water to create amazing and different views around each bend of the road. . These towering black rocks made a sharp contrast against the constant waves of the Pacific and the blue sky. Surfers in their wetsuits rode the waves and kayaks bounced across the ocean. A couple young men enjoyed hang gliding and the winds must have been perfect that day as they were airborne for a very long time. Might have to try that on another trip to experience the sensation of flying! Everywhere you felt the happiness of people relaxing from the cares of the day. There was no resisting the temptation to find a place to pull off the road and walk on the beaches. 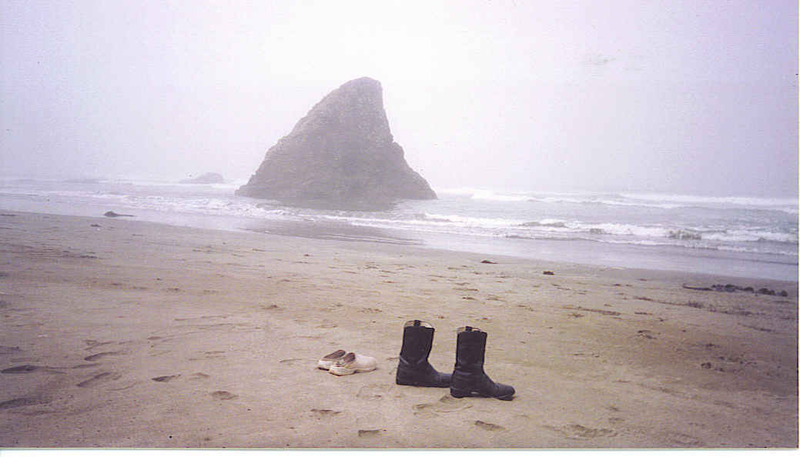 Leave your shoes behind so you can feel the power of the waves wash over your feet. Two golden labs approached with a frisbee in their mouth so ended up the day playing catch with the labs. Memories of the ocean will live on, long after the footprints in the sand are gone. The Pacific Coast Highway, Highway 1, begins in Oxnard, Washington and continues along the coast through Oregon into California all the way to San Diego. 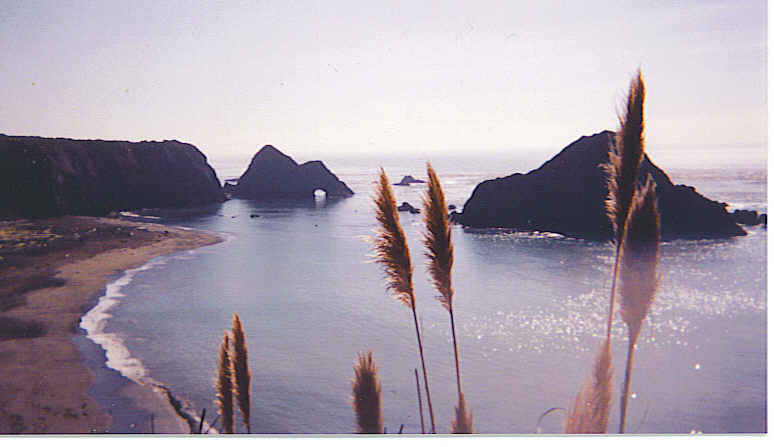 Sometimes Highway 101 bends inland so watch carefully if you want to enjoy the scenic journey along the coastal region. Come discover a place where time stands still as you descend into Hells Canyon carved by the great Snake River. As you drive down into the canyon, quiet and beauty surround you. 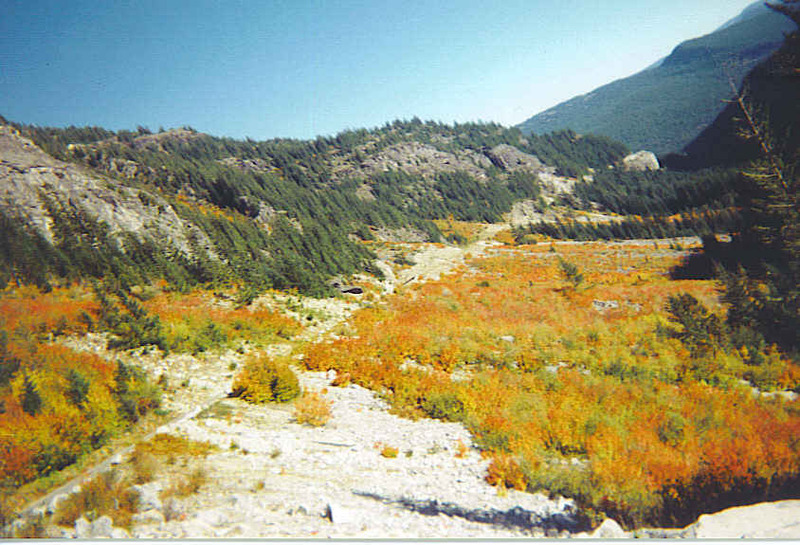 Here is the deepest river gorge in North America with heights of up to 9000 feet surrounding you. It can be approached from either the Idaho or Oregon side, but this day the approach was from Idaho Highway 86. You will eventually find yourself driving on the famous Canyon Scenic Byway, “Devil’s Tail”, also known as National Forest Road #454, leading to Hells Canyon Dam at the end of the road. Scenery was awesome and it seemed impossible to capture the towering feeling that surrounded you as you drove along the Snake River in the bottom of the canyon. This canyon separates Idaho from Oregon in a most spectacular way. The forest road along the top of Hells Canyon was a one-lane dirt road, which was rugged and steep and took several hours to ascend. Towards the top, the road was covered with a light coat of snow. The last 350 yards had to be traveled on foot in order to arrive at Heavens Gate where the altitude was 8,690 feet and the scent of pine hung thick in the mountain air. The foot path was rough, but the view from the top was breathtaking, my favorite view of the canyon. 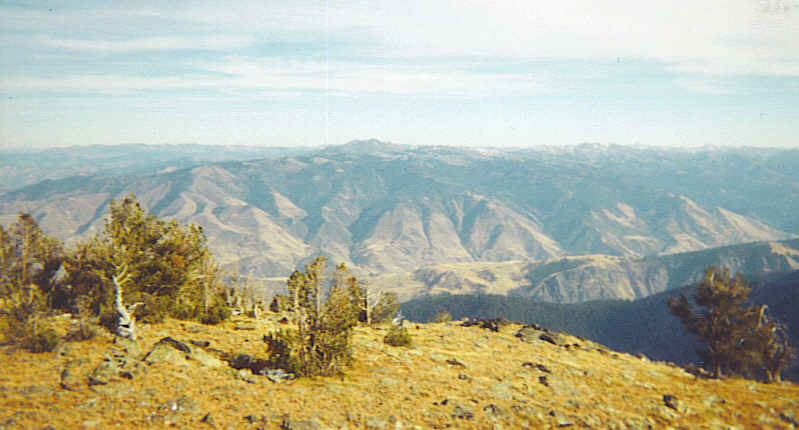 From this point, you could see the snow covered Seven Devils Range and the Snake River. There are actually twenty peaks in this range with He Devil and She Devil being the highest, both at about 9400′. At one angle you could see four states: Idaho, Oregon, Montana, and Wyoming. Back in 1955. 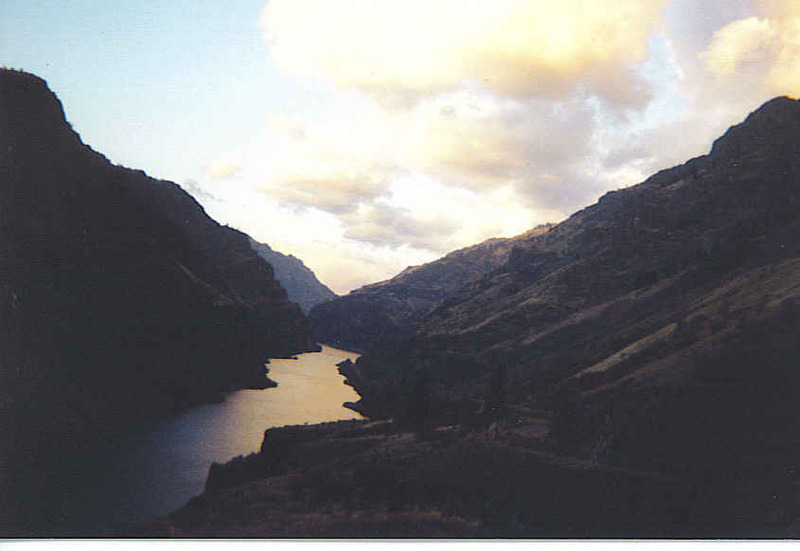 Idaho Power Company began construction of a three dam project in Hells Canyon. First a road had to be constructed and even then couldn’t bring in all the needed supplies. Helicopters were used to bring in tools and equipment as well as help with erecting the transmission towers that carry the power out of the canyon to the Oregon side. Finally, we reach the end of the 22 mile road and cross over the dam to the Oregon side where the Visitors Center is located. On close observation, the rugged rock walls of the canyon are like a museum with pictographs and petroglyphs left over from the time when Chief Joseph’s band of Nez Perce Indians lived there. Some say part of the petroglyphs date back possibly 15,000 years. Nez Perce Indians enjoyed the mild winters here as well as the lush foliage and plentiful wildlife. The Snake River provided abundant fish as well as goods they would be able to trade. Later, in 1895,a cargo ship captain, named Haller, met with rapids more dangerous than expected. Either because of people discussing his adventure in Haller’s Canyon, or perhaps what the captain said when he got in this dangerous situation, the name Hells Canyon stuck. The precipitous mountain sides and the wild rapids seem to reinforce the idea that the name chosen was very fitting. There is only one way back out of the canyon from the dam, and that is back the same 22 mile road that was originally used to enter. But now it is dusk and the drive out will be a careful one, driving slowly because of the sharp curves and always being aware of dodging fallen rocks either in the air or on the rugged highway. Be sure to keep your eyes on the road and stop when you want to really enjoy the scenery. Today this magical place is great for whitewater rafting, jet boating as well as fishing excursions. Just being here makes you look at the world with a different perspective. Great spot to relax and leave your worries behind. See you in Hell’s Canyon! 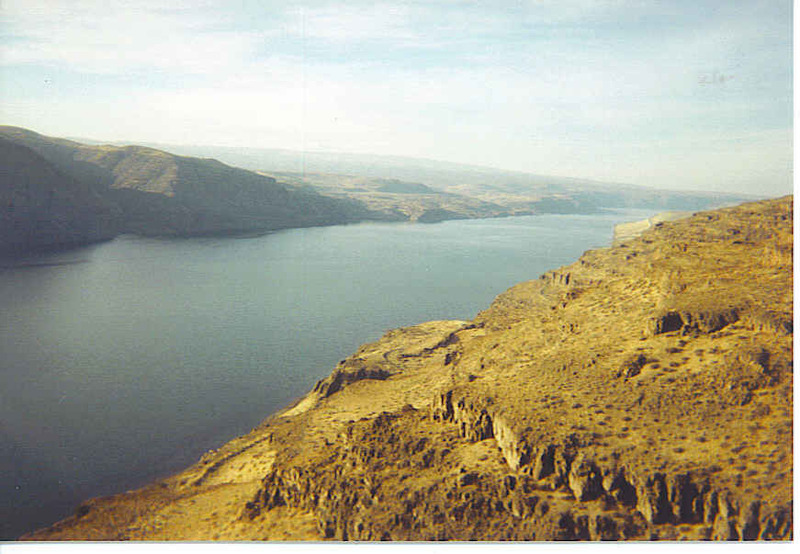 Hells Canyon can be reached from I 84 in Idaho at Exit 304 Hells Canyon/Weiser Road. Follow the signs for the Canyon Scenic Byway and enjoy the adventure.